Thankful for Friday, people awaken ready to look past the workday. Desks are cleared early and highways jam with hunger – hunger for freedom from the clock. We are so accustomed to days that are filled with scheduled hours and minutes. So who is surprised that we often over-schedule ‘time-off’, leading us to places ‘familiar’. Places we find within our own circle of travel. When you can feel ‘free from the clock’ take time to explore… never know what you might find! 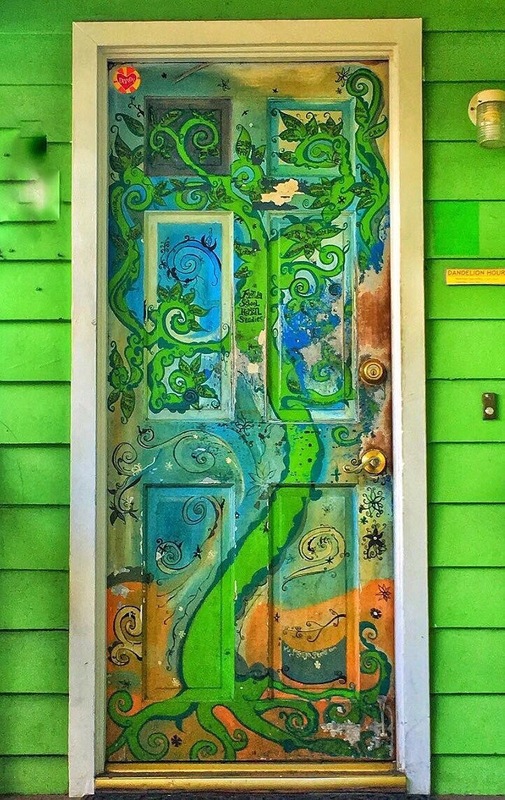 Friday- a day when doors can look more playful- when they might even spark ideas to slow the pace and bring out creativity to refresh the spirit. We thank God for every day but Friday can bring a gleam in our eyes and fill our hearts with gratitude. Whatever day is your Friday- may it offer the promise of time. A little crooked- yet this door brings delight and welcome. It is good for the soul to practice gratitude in the midst of our imperfection. Life offers beauty and delight throughout its crooked path. A great way to move through each day… practice gratitude. No doors to close or ceilings to contain – room for the wind and spirit to move, drawing seekers near. On faith we enter this sacred space. Through it may we find renewal and inspiration. “I can hear the hush.” – reflection on my Facebook page as I shared this morning’s ‘door’. Recently I have noticed more postings with quotes about silence. Silence and its ability to calm and heal the unsettled heart. We are living in a time when unsettled hearts are too common. Seek the places/moments where a hush can be heard. May the brief quiet bring calm.